The Vladimir Lenin ideology was based on his thoughts and actions on abolishing oppression, class division and social exploitation…establishing social control, common property and equitable distribution of wealth. This ideology was a huge influence not only on the lives of the inhabitants of Pripyat, but the whole of the Soviet Union. Lenin became a legend…even in his lifetime. 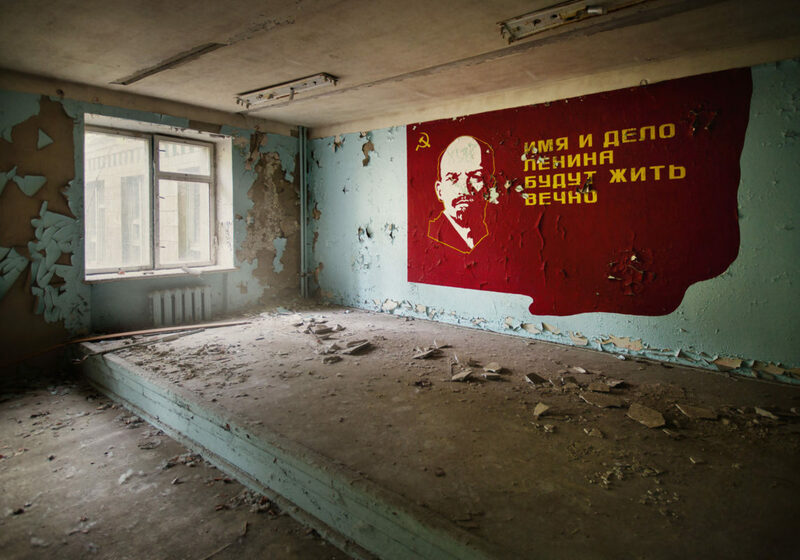 Lenin is hands down the most numerous inhabitant of Pripyat….he is everywhere. His pictures, images, drawings are found on the walls of all government and cultural institutions. Offices, factories, cinemas, theatres, schools and kindergartens. The figure for whom statues were built, songs and poems were written. Awarded with medals and orders in his name. Schools, squares and even a city were named after him. It is no surprise that after Lenin’s death the party rulers decided to take advantage of his popularity and authority as an element of propaganda of the system. In Pripyat as well.